Not much to report on this month because I haven’t had a chance to do any sewing, except at our local Repair Café. It’s a monthly event that’s all about cooperative economics and keeping things out of landfills by repairing them. We usually have it once a month or so at varying locations in the Pasadena area. I just show up and sew, which I did this past Saturday. And so I have a few random thoughts, but not much else. 1.) Repairing other people’s stuff is way more interesting than fixing your own. Like many folks, I have a huge pile of clothes that need new buttons, holes patched and various other mends. I’ll get around to them. Really. I will. But shortening the sleeves on someone else’s shirt and patching it? No problem. Done in minutes with a grin. 2.) If your sewing machine won’t sew right, more often than not it’s because you have it threaded wrong. Had that one reinforced by not one, but two sewing machine repairs that our other seamstress, Mary Gothard, had to help our tinker Scoops deal with. Especially if the darned thing was working before, get out your manual and try re-threading it. 3.) It’s surprising how far you can get by just diving in and doing it. I pulled a zipper replacement that would have gone a lot more smoothly if I’d actually paid more attention to what I was doing. That being said, two other seamstresses didn’t even attempt it. Granted, zipper replacements are a massive nuisance. And this one was on a vintage dress with great sentimental value. And the replacement zipper provided was an invisible one. And I hadn’t slept well the night before. And, yes, I turned the air blue while working on it. Oy. It got done and the rip I tore got fixed. Moving on. 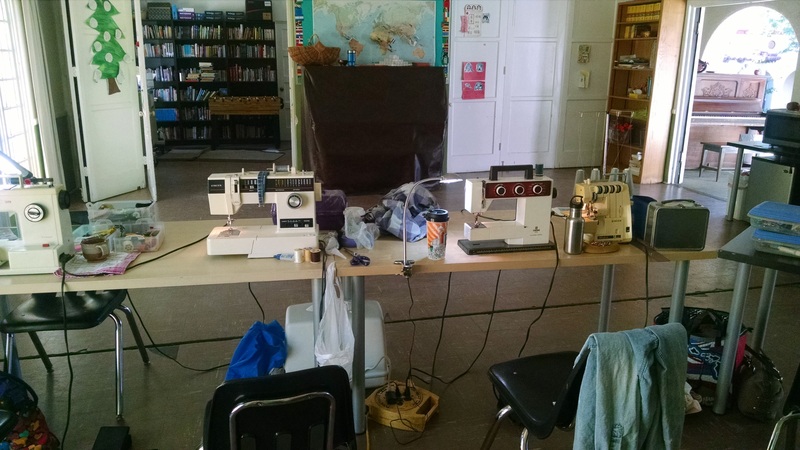 Our next Repair Café will be at Villa Park in Pasadena, California, and I will be there with my sewing machine and serger. At least, that’s the plan. If you’re in the area, feel free to bring all those items that just need a patch or a button or other stuff. We have all kinds of workers, including tinkers, who can repair clocks, toasters, vacuum cleaners, you name it. And finally, a big shout out to fellow seamstresses Mary Gothard, Jennifer Michaud, Shelley and Bya, all of whom made it even more fun by sharing resources and ideas. Let me know when you want your buttons done. We’ll work something out. What a fantastic group! Reading about your sewing adventures, reminded me of my (long gone) sewing days. I really enjoyed making my own clothes when I in my teens. I’m glad you enjoy the posts. Odd how this one gets the most comments and I really didn’t think it would get any.